The Royal Palace of Hatfield was originally built in 1497 by John Morton, bishop of Ely and minister to King Henry VII. It was seized by the crown during the reign of Henry VIII, and his daughters Elizabeth I and Mary I both lived at the palace at different times. The palace originally had four wings arranged around a courtyard. However, in 1607 James I exchanged Hatfield for Theobalds House, which had been built by William Cecil, chief advisor to Elizabeth I, in the period 1564-85. Hatfield thus became the property of Robert Cecil, who demolished three of the palace wings and used the bricks to construct Hatfield House. Hatfield House is situated at higher ground than the former royal palace. The main approach to the house is via a viaduct, constructed above the town of Hatfield in 1872. The first view of the house is of the north front, though prior to 1872 this was actually the garden front. The facade is very square in shape, with gently protruding wings and with projecting bays as the only exception to an otherwise flat silhouette. The central clock tower, however, is also visible from this vantage point. 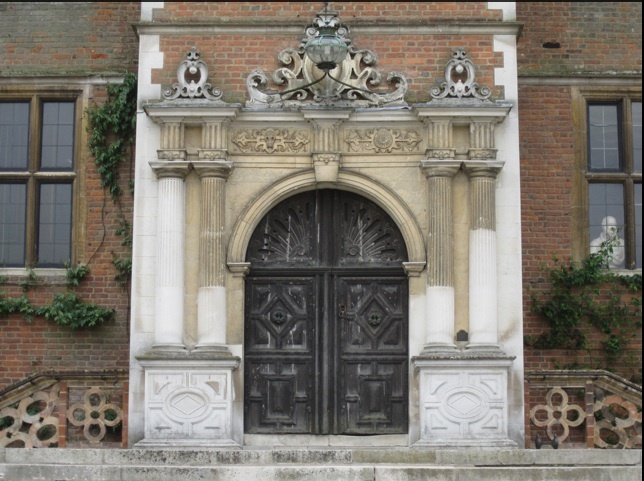 The main entrance is typical of Jacobean classicism, adorned with Flemish-derived strapwork ornamentation. The term is used because the elaborate geometric patterns resemble leather straps. The entranceway was presumable designed by carpenter Robert Lyming. The south front, originally the main entrance, is a lot more elaborate than the north front. Whereas the projection of wings on the north front is so slight as to be almost unnoticeable, they are prominent on this side and end with ogee-capped towers. The central wing is decorated with a loggia, though the arcades have been filled in, and the central bay is carved in a three-storey frontispiece. The loggia and frontispiece was designed by Robert Lyming, but is unclear to what extent he designed the building as a whole. Robert Cecil is also said to have consulted Simon Basil and Inigo Jones, and Cecil himself probably took part in the design process. As his father, he was an avid builder. He built Cecil house in the Strand and extensively remodelled Beaufort House in Chelsea and Cranborne Manor in Dorset, the last of which still stands. The second storey of the loggia houses the long gallery. According to the guide, the purposes of galleries such as this was to provide a space for women to take walks in bad weather. The west wing gives a sense of the discordant use of mass, presumably the result of changes to the original plans being implemented midway through construction. Building works began in 1607 and were completed in 1611. Robert Lyming was later to design Blickling Hall in Norfolk, a project for which he was described as architect and builder. It was to be the last in its style and is actually a younger building that Inigo Jones' Banqueting Hall at Whitehall. It was completed in 1624.